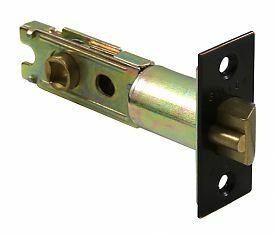 Emtek 2-3/4" Dead Latch for Keyed Knobs or Levers. View more from Emtek Products, Inc.
Warranty: Limited lifetime mechanical warranty to original consumer user of product. 5 year Finish warranty on Emtek products with the follow exceptions: Bronze Patina is a living finish that will gracefully age, revealing the underlying bronze over time. Because of this characteristic, no finish warranty is offered on bronze patina products, rust, or silver patina. Brushed Stainless Steel carries a five-year finish warranty. All stainless steel will require some periodic cleaning to keep your hardware looking like new. Unlacquered Brass (US3NL) is a custom, made-to-order finish. It is available with an up-charge, per item and requires an additional 2-3 day lead time. This living finish will gracefully age and evolve in appearance over time. Because of this characteristic, no finish warranty is offered on unlacquered brass products.